... and the cheese enchilada with the rice and beans and both were very tasty.Street tacos are better.They have an assortment of meat and meatless dishes including tacos, quesadil...great tacos, burritos. Great food. Wonderful service. Very clean. Ownerw came around to make sure everything was being taken care of. Mexican restaurant with inside or outside dining. Typical Mexican menu. Food was made with very fresh ingredients and was served promptly. Prices were very inexpensive and service was great. We always enjoy our lunches here. 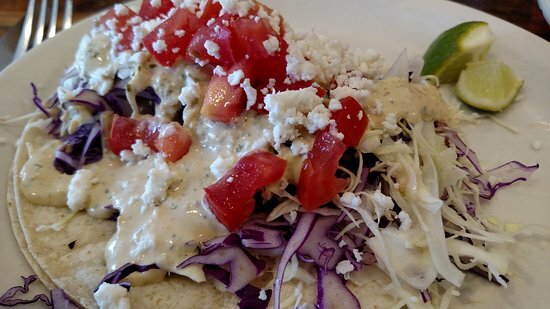 They have an assortment of meat and meatless dishes including tacos, quesadillas, burritos, salads, chimichangas, etc. My wife loves the grilled vegetables. Nice beer and wine list. Very helpful and super friendly service. Nice red and green sauces. Don't pass this one up! Local Favorite! Excellent shrimp tacos and sides. The tortilla chips are addictive. Can't go wrong with any selection. Pleasant service. Despo's makes really good food, but the restaurant is very crowded in July. We ate here two nights and both times it was packed. Arrive early, before you're actually hungry. Get quick answers from Despo's Mexican Restaurant staff and past visitors.